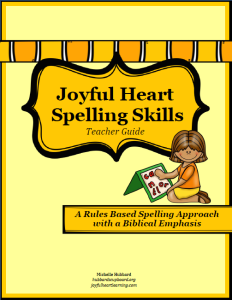 Joyful Heart Spelling Skills is unique in that it is a rules based spelling approach with a Biblical emphasis. 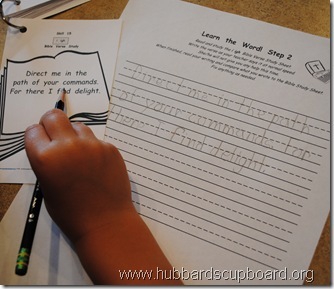 Incorporating God’s Word with the learning of spelling skills was the foundation of this curriculum. How does Joyful Heart Spelling Skills integrate Scripture with spelling? Each spelling skill in the curriculum focuses on a verse or short passage from the Bible. 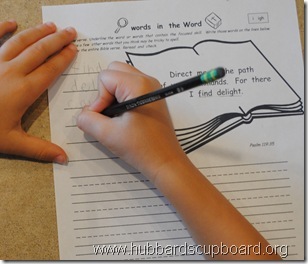 Verses from God’s Word were carefully chosen so that children would have at least one word that incorporates the current spelling skill, would have a few words that assist in reviewing previous skills, and would not add too many words involving skills not previously taught up to the point of the current skill. A Bible Verse Study sheet is available for each verse and is ready to print onto regular paper or reduced and printed onto an index card. Children are encouraged to look up and read the selected verse in their own Bibles, discuss the verse, and memorize it during the duration of the spelling skill being studied. Each verse is used for copywork and dictation exercises as well as for searching out any words that contain the focused skill. What is the significance of copywork and dictation in relation to spelling? 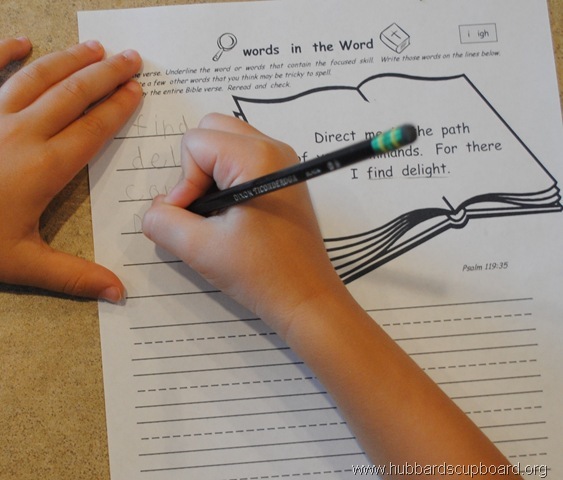 On their ‘words in the Word worksheet’, children are asked to find a word or words in each Bible verse that fits the spelling skill being studied. During this step, the teacher is drawing the child’s attention to correct spellings and pointing out the spelling rules and patterns in context. This prepares children for more successful copywork and dictation. 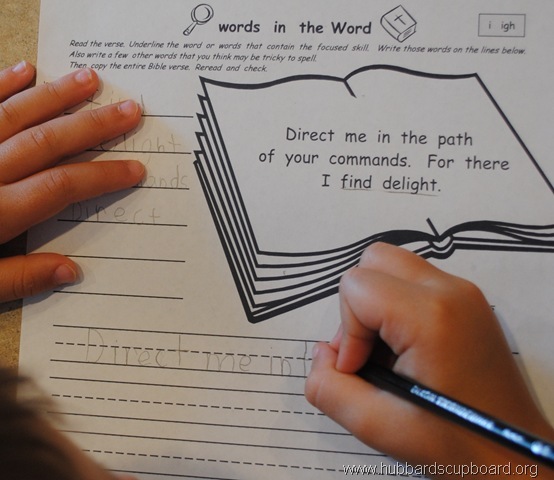 During copywork, children are constantly referring to a correctly written model and visualizing the correct spelling of words as they write their own copy of the Scripture. 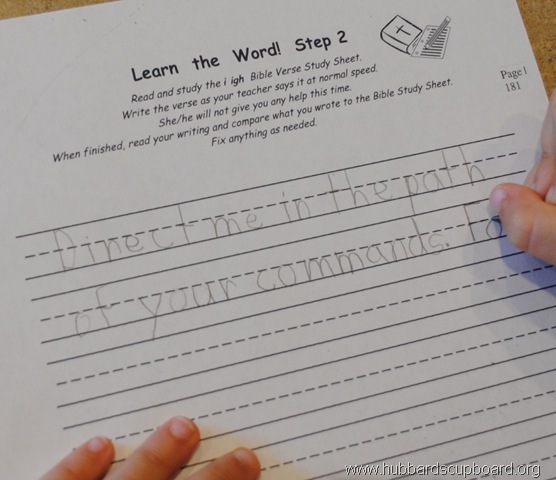 Dictation comes after copywork and a thorough review of the Bible verse. Children study the verse before having it dictated to them. This is modeled after the Charlotte Mason method of prepared dictation. The dictation aspect of Joyful Heart Spelling Skills helps to solidify new spelling skills as well as offer a review of previous spelling rules in context. 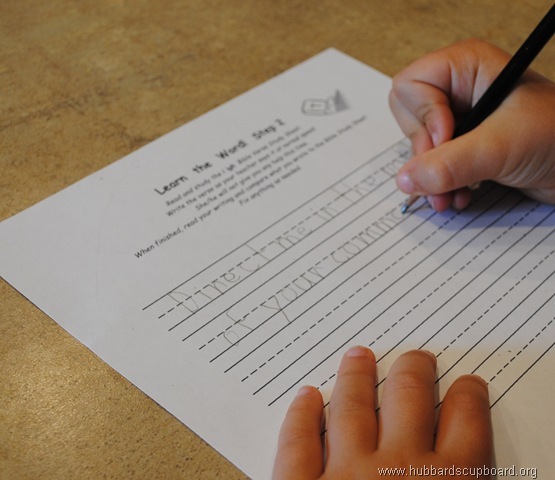 Children check their own copywork and dictation against the original, using careful observation. They have a correct model to compare to and work toward accuracy. 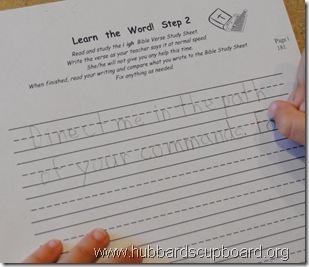 Finding a word or words in each Bible verse that fits the spelling skill being studied, carefully copying God’s word, and then providing time for dictation of the same Scripture gives children the opportunity to practice what they are learning -not only spelling skills, but also capitalization, spacing, punctuation, grammar, and handwriting. 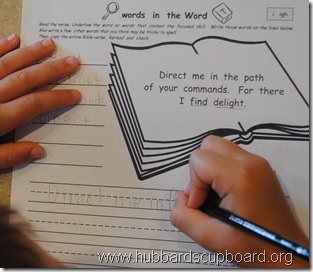 It gives children the opportunity to practice and use correct spelling within the context of God’s Word.